Elizabeth: I’d really love it if The Elephant in the Room landed in people’s inboxes in ten years and it seemed laughable because it was so completely out of date. Kenny: What is the exact number of posts you’ve written and will you use that number somehow on a lottery ticket or as part of the address of a character in one of your future book? Elizabeth: As of this week, I’ve written 593 posts. I could use that number as the word count goal in my next picture book, or as the limit for the number of Thin Mint Girl Scout cookies I’ll allow myself next year. Kenny: I call that a plan. Which of your posts made you laugh the most while composing it? 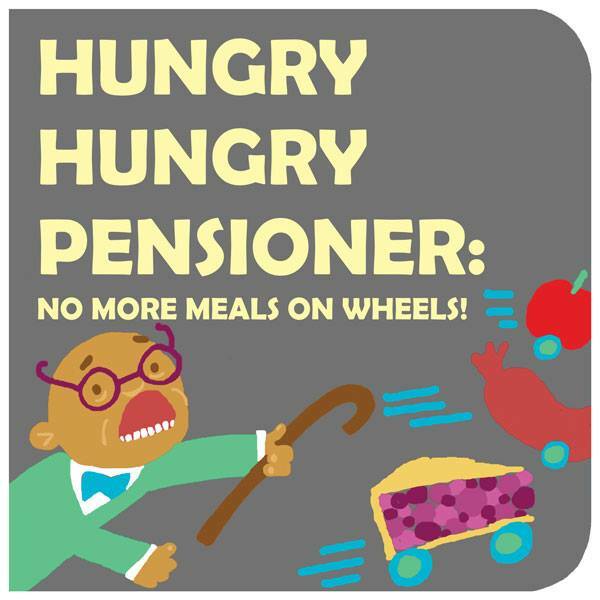 Elizabeth: While I had a lot of fun with this year’s April Fool’s post (Bezos Shutters Amazon “for Greater Good”), my favorite has to be Hungry Hungry Pensioner: A New Board Book Line, which was painfully funny to write and included brilliant art by some very talented illustrators. Kenny: That really was a great one. Which post will you admit to cringing over the most looking back at it? 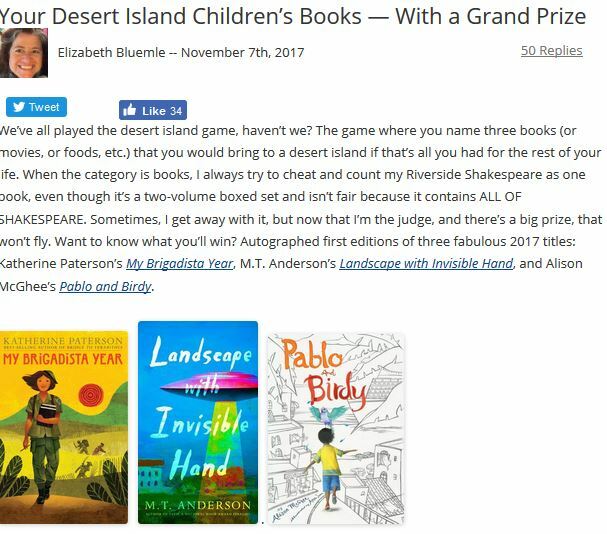 Elizabeth: As you know, I blogged early and often about the lack of diversity in books for children and teens and in the halls of publishing. While my intentions have always been fiercely sincere, I’ve made some inevitable missteps as my own education and stages of understanding have evolved (and of course continue to evolve). This post made me uncomfortable even as I wrote it, and my complicated thoughts about it afterward led to a follow-up post the next week. But I was glad to re-read the original post and see the line, “I’d love to see a picture book biography about Mae Jemison, the first African-American female astronaut,” because of course now there IS a beautiful picture book biography, Mae Among the Stars. I’ve always been most glad to see old posts that are now out of date because some of the problems they raised have been improved upon now. Kenny: Is there a comment you received that really sticks out for you? Elizabeth: Like all of us ShelfTalker bloggers, comments are what make all the writing worthwhile. (Readers have no idea how much we appreciate receiving comments on these posts.) There have been many great, funny, informative, and useful comments over the past ten years. The most wonderfully surprising one came on a post about an obscure picture book I had loved as a child; somehow, the author’s daughter came across my post and wrote to me. That was a gift! The one that still haunts me is actually the absence of a comment, from a reader who won three autographed books in one of my contests, and never sent me her address. Those books are still on a shelf in my office, waiting for that follow-up comment…. Kenny: You’ve done a lot of good deeds through your posts, helping launch the Sheepover books, crusading for inclusion, and so forth. Which of those worthy deeds are you most proud of? Elizabeth: I don’t know about good deeds, but being one of the voices shouting out for diversity is undoubtedly the thing I feel happiest about. To me, it’s always been the most pressing and important issue in publishing and bookselling, and to see the cultural conversation finally, finally start to shift in the right direction—through the efforts of longtime advocates like Wade and Cheryl Hudson, activists like Zetta Elliott, social media movements like We Need Diverse Books, publishers like Lee & Low and Tu Publishing, cooperative groups like the CBC, etc., pushing things forward—well, that is incredibly heartening. We still have a long way to go, but at last there is real movement! One last comment — my favorite addition to the ShelfTalker blog over the past ten years is the addition of YOU, Kenny, and Megan, Cynthia, and Leslie to the writing team. I’m always blown away by the charm, creativity, and content of your posts. Kenny: Happy anniversary, Elizabeth… and many happy returns too! Elizabeth and Kenny I always love your posts! Even if I don’t comment. Please, please keep writing!